The City and County of Honolulu will be removing the monkeypod trees at most of the cul-de-sacs in the West Loch Fairways Project and replacing them with rainbow shower trees. Please see the letter and details of the work to be done, from the Department of Design and Construction, City and County of Honolulu. 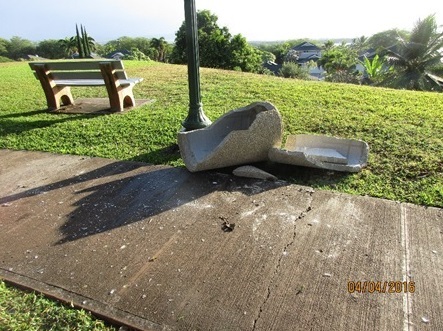 On Sunday April 3, 2016 at around 5:14pm both concrete trash receptacles at Lookout Park were smashed by several young males who forcibly tipped them on to the sidewalk. The receptacles were broken into several pieces and broken glass and rubbish were thrown all over the sidewalk and turf. The receptacles are valued at approximately $1500. 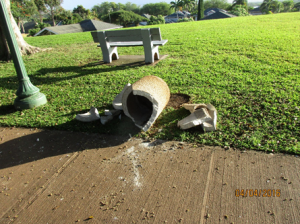 If you have any information regarding this criminal activity please call HPD at 911 and the West Loch Fairways Site Manger.